It even sounds nice rolling off the tongue. Pergola. On the patio or deck, it extends the property structure by providing an arbor or projection from the roof going forward and creating a delicate shade cover. While it would seem to be sparsely constructed of horizontal trellis work supported by posts or columns, the pergola provides much more than it appears to at first blush. A pergola and deck in an English urban garden. The pergola is as versatile as you need it to be. The open nature of its construction is surprisingly protective from the harshness of direct sunlight while still allowing for the filtered light to come through. This is as significant whether it is filtered sunlight or romantic moonlight. Typically, the construction is simple. Lattice may be horizontal or create a crosshatch pattern as dense or sparse as preferred to allow light through or to encourage the growth of plants and flowers. Further trellis work may be added to the sides to establish an enclosure. The arbor is a perfect example of how lovely the growth of blooming plants may be. Never underestimate the effect of sunlight through the shading plants as a breeze carries the light scent of the flowering blossoms. When family and friends gather beneath the natural cover, memories are made. When an aspect of the architecture incorporates landscaping while providing a protective enclosure, the experience shared there is compelling. Such appointments are what contribute to the value of the home and allow occupants to get the most from the home experience. 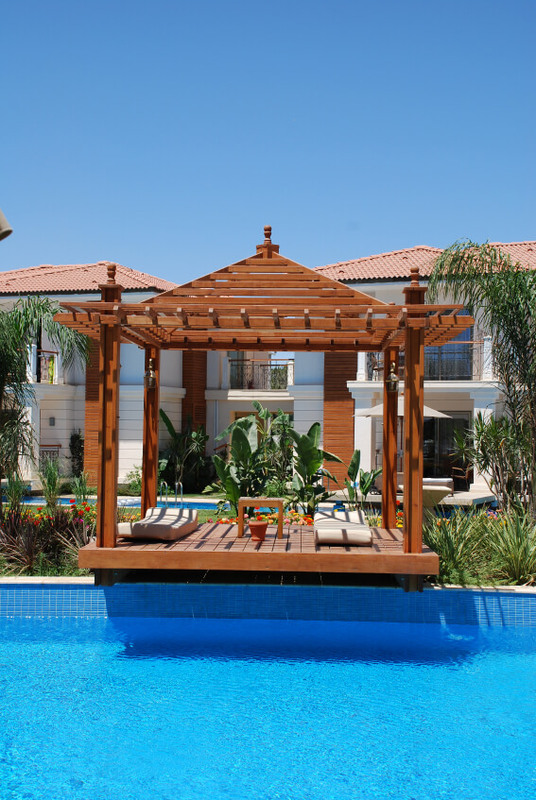 A pergola need not be attached to the house, although that’s the original meaning of the term. However, it’s easy to see how versatile these covers are when taking the available space into account and planning for entertaining. 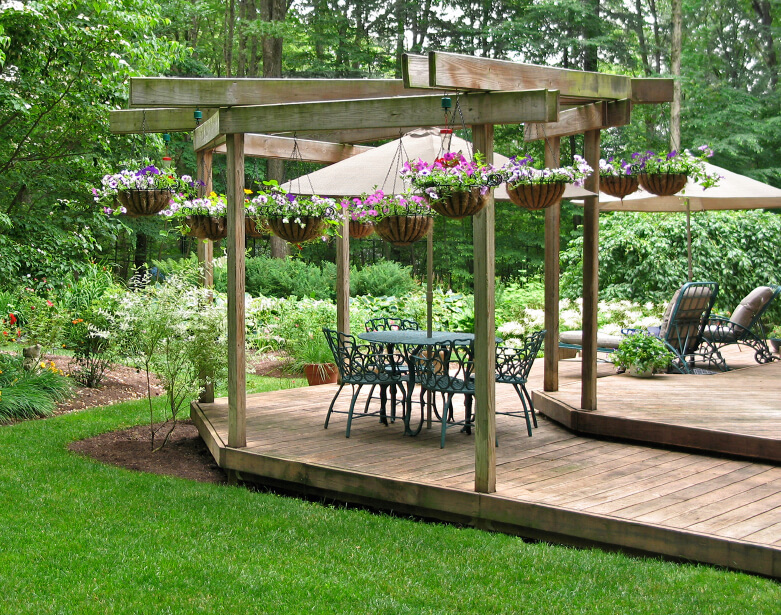 The decking is often planned with the placement of the pergola in mind. It is not hard to imagine the treatments that contribute to the atmosphere and how a pergola covered deck contributes to the experience of enjoying nature to its fullest. Think of the water treatment wending its way beneath the decking you are walking on as you reach the covered area where you can rest, read, socialize with family and loved ones, and enjoy meals al fresco. Pergolas can be covered in a more permanent fashion—for example, using plexiglass to keep the raindrops from spoiling the fun, yet allowing you and your guests to remain safe and dry while enjoying a summer sprinkle. In other applications, the awning itself can serve to support electric fans to keep the breezes blowing in environments that are particularly warm. These amenities begin to introduce more ideas of how a covered pergola may provide added features for entertaining. In the close view, the accent of grape leaves always delivers the gentle and prolific green accent that may even provide you the gift of grapes to enjoy. Lighting is another treatment that may add to the ambiance of being under the stars. Taking a long view, it’s possible to see how the surrounding hardscapes can accent the construction and provide a sense of time and experience. The enjoyment of the areas that are built to accommodate a healthy social environment is enhanced by something as simple as pedestal pots with cascading plants and fencing that complements the pergola structure. Who doesn’t want to make a memory? 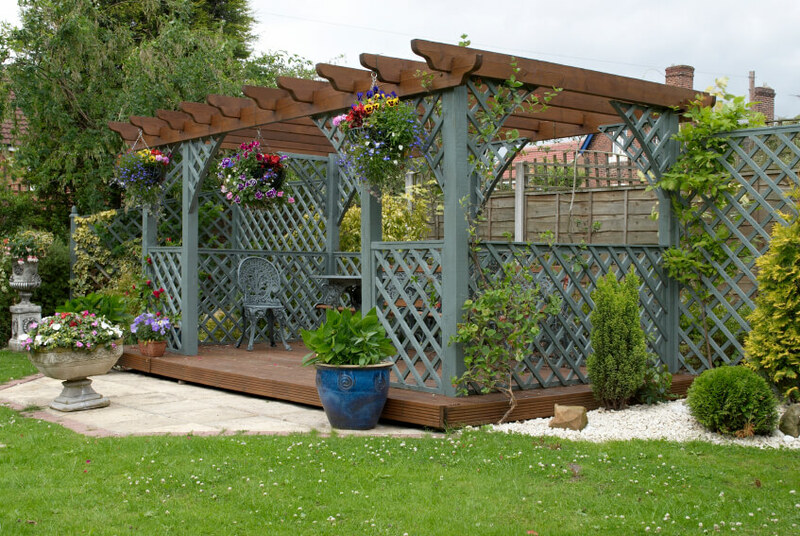 Versatile, easy to construct, less of a commitment than a conservatory, and less expensive than an extensive patio covering, the pergola presents the opportunity to expand ideas.